New in the Resource Portal: The Client Path Training Module – Legacy – Plan. Prepare. Prosper. If you have been working the Marketing Plan as laid out by JG in the marketing training module you are likely beginning to engage prospective clients at a more personal and 1:1 level. As a LEGACY REIA you have numerous tools available for you to take that prospective client from that first “Elevator Pitch” through to the submission of an “Introduction”. The path a particular Client might take can vary and the tools you deploy need to match and serve that client’s situation and goals. To help you navigate those paths and the steps along each of those paths we have released a new training module to support you. This training module is very comprehensive with training videos from Richard Dolan and Role-play videos from Richard and JG. The resources and tools that your need for each step are included in the lessons and available for your download and use when needed. On this page, you will notice there are navigation options on the left for Short, Medium and Long Path. Although there are many combinations and directions you may go with a prospective client we have created three path types that should cover most of the situations you might face when working with someone. Also on this page is a video designed to help you navigate the overall Training Module. 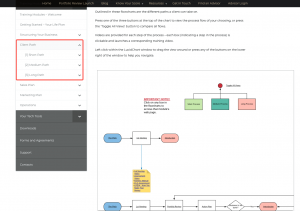 On this page you will see a window with a flow diagram – we have created a step by step diagram for each of the paths. If you click the “Toggle all views” you will see all three paths in the window. From there you can click any of the steps or boxes and that will launch you to the corresponding Lesson on that step or topic. You can also click either of the Path Buttons and explore that path as a stand-alone. Each path has a brief overview video introducing you to that path, what it represents and when you might use it. This training module contains a lot of content AND will continue to be adjusted based on feedback and as additional training videos come on line – so check back! In the meantime jump in. It may be counter-intuitive but jumping in on the Long Path training may give you the most impact as what you learn there is applicable and used in the Medium and Short paths. Please feel free to feedback any thoughts or requests – remember you are in this business for yourself not by yourself. Nice work LREIA Darcy Marler! New on your Personal Marketing Page: AIDA is alive!